It’s that magical time of year when there isn’t a weekend without a great fest and this weekend Daulat Ram College put forth a commendable show. The second day set sailing with the first event being the Indian (Group) Song competition which saw participation of students from various colleges displaying plethora of talent and thrilling the audience with their voice. The western dance competition – Taniec – witnessed the maximum footfall and a jam-packed auditorium with students cheering loud for the splendid performances. About 6 teams participated in the competition of which IP College for Women captured the first prize while Venkateswara College grabbed the second prize. However the show was stolen by IIT-D boys who put forth an electrifying performance and left the crowd craving for more. Unfortunately, they were disqualified from the competition because of being late. “We were at fault somehow, but the stage was good. We liked performing here,” expressed Aakash, President of the IIT-D team. 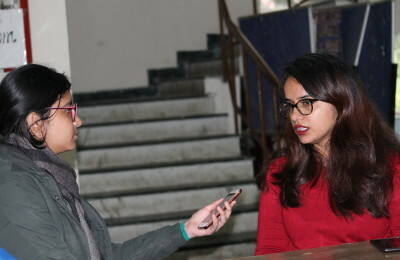 One of the students from the audience quoted, “IIT-D would have easily won the show, but they were unluckily disqualified.” Mata Sundari College too was disqualified on the same grounds. This year the cultural festival had in store a surprise Fashion Show by the Economics Department of college, which uniquely integrated fashion with Economics and proved to be a creative new concept. Another event in the row was Classical Dance, which was won by Pragati from DRC while Rajkumar form Shyam Lal College and Meera from DRC got Appreciation Awards. There were many events being conducted parallel to these events like Ad-Mad, Mime, Dramatics Wheel etc. which were fiercely competed between students of different colleges. By the afternoon, the college was abuzz with students who had gathered to witness the star of the evening Nikhil D’Souza. Without much delay he came (lauded for being on time!) and swayed the crowd with his foot tapping numbers as Har Kissi Ko Nahi Milta, Mere Bina, Shaam etc. The weather was kind and the atmosphere mellow, with fun and frolic in the air the gala fest came to an end. The students of DRC left no stone unturned to make the fest a resounding success.